Untitled print, Paul Sandby, 1762, British Museum. Thanks again to follower Adam Hodges-LeClaire for pointing this piece out to me. 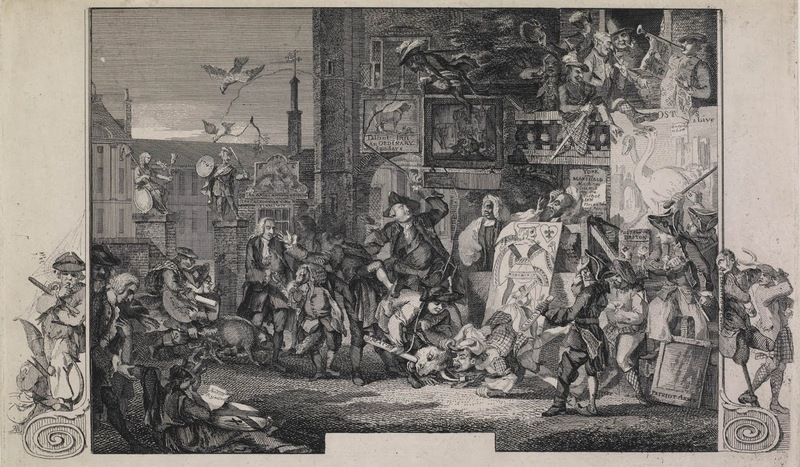 The curators of the British Museum, in the catalog entry for this piece, believe this to be Sandby's reply to William Hogarth's cartoon The Times. The public debate around the peace negotiations to end the Seven Years War got hot in the press, and Hogarth's Times was copied and answered several times by other artists. Sandby's is possibly the most artistically sophisticated of these responses. There's a lot going on here, and for more on the political message and the various figures, I do strongly recommend reading the curators' catalog entry. As always, I'm going to focus on the tars in this cartoon. In the frame on the left and out of frame on the right sailors bookend the piece. Clutching a broken anchor and covered in cobwebs, a sailor and a grenadier stand atop the scroll outside the left frame of the cartoon. They are juxtaposed against a Scotsman beating a legless man with his own wooden leg on the right scroll. The broken anchor is obvious enough, but the cobwebs suggest disuse, which is hard to argue for the Royal Navy in the final year of the Seven Years War. Fighting a war on multiple continents meant that even with the French Navy shattered by the numerous victories of 1759 the British fleet was stretched across the globe and constantly sailing from one ocean to the next. Perhaps Sandby intended this to be a warning of things to come? This sailor wears a reversed cocked hat with a narrow brim over his bob wig. His handkerchief is worn over the jacket, but the style is indiscernible. The jacket itself is tucked into his wide legged trousers, and may be intended as a frock, as I can't make out any opening on the front. In any case, the jacket ends in slash cuffs. To emphasize his poverty, the sailor has a patch over his left knee. The trousers end about the bottom of the calf. His uniform is decidedly that of an officer, and the trousers may be intended to make his affiliation with the sea apparent. I disagree with the curators assessment of the man standing behind him. The handkerchief over his jacket and the stick in his hand are the marks of common seamen, not officers. Neither of these objects are present on the Duke of York himself. The sailor also wears a bob wig.